The great thing about covering business in my 9-to-5 is that it allows me to capitalize on the knowledge and contacts I’d accumulated in five years as a sportswriter, and write about sports for what it really is for a lot of us. If you don’t believe me ask Manny Pacquiao, who brought several million dollars of economic impact with him when he swept into Las Vegas for Saturday’s title fight with Juan Manuel Marquez. Or ask Lucia McKelvey, the agent Top Rank hired specifically to seek out endorsement deals for Pacquiao, and whom I interviewed extensively for a feature I published in the Star’s business section about building the Pacquiao brand in the midst of a sport that’s allegedly dying. When examining the factors that make Pacquiao one of the most marketable athletes in North America there’s no underestimating the power of his personality, or at least of his pleasant public persona. Last year BusinessWeek published its annual list of the 100 most influential athletes in North America, Pacquiao ranked 24th — ahead of the heavily marketed Dwight Howard, Yankee legend Derek Jeter, and measuring stick Floyd Mayweather, who finished just outside the top 100. Not surprising given that Pacquiao, who pitches damn near every product imaginable back in the Philippines, is becoming increasingly ubiquitous over here. The surprise was that according to stats provided by the firm that constructed the list, Mayweather was actually the better known fighter as of last winter. CSE analyst David Newman told me Mayweather was known in 18 percent of households polled, compared with just 12 percent for Pacquiao. The difference, he said, is that Pacquiao is much better-liked and therefore a much better ambassador for brands seeking a high-profile athlete as a pitchman. Mayweather, I’m sure, is aware of it, and the fact that he draws better pay-per-view numbers than any non-heavyweight in history stems directly from a conscious decision to ditch the Pretty Boy Floyd persona in favour of the arrogant, obnoxious Money Mayweather character he now plays. If sponsors won’t pay because they love you fans will pay because they hate you — and Mayweather takes home more money than any fighter in the world — but there’s not much money in the middle ground. Which works just fine for those of us hoping a good-versus-evil clash for all the boxing marbles will take place this spring. Mayweather did his part by dispatching Victor Ortiz in September, then staking out May 5 as the date for his next fight. Now Pacquiao needs to do his. He’ll ride a rising tide of popularity into his welterweight title fight with Marquez Saturday night, but if a high public profile and devoted fan base guaranteed success Tim Tebow would have a string of NFL wins as impressive as Pacquiao’s victories in the ring. 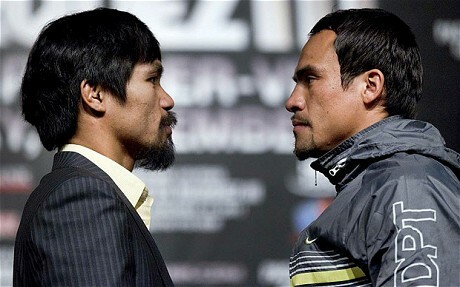 At the same time, a growing number of observers point out (correctly) that in the first two meetings between these men Pacquiao prevailed by razor-thin decisions, so while an exciting fight is a given a Pacquiao win isn’t assured. And if a Pacquiao victory doesn’t happen, neither does the megafight with Mayweather, which might be what everyone involved deserves after allowing this nonsense to drag on for two years. Top Rank and Team Mayweather will have learned an expensive lesson about teasing a sports public that just wants to see the best face the best, and the rest of us can focus on elite boxers who actually want to confront each other. But it probably won’t come to that. Marquez is a smart boxer and sharp counterpuncher, but nowhere near as explosive at welterweight as he’ll need to be to derail Pacquiao, who has already proven he’s comfortable north of 140 pounds. 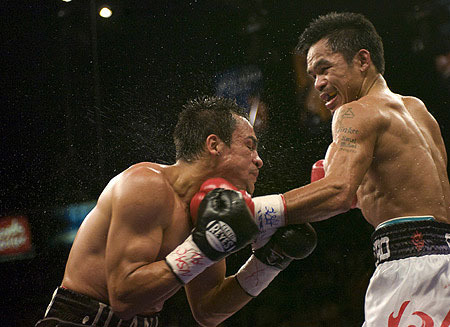 Look for Pacquiao to break Marquez down as the rounds pile up, finishing with a win that will boost his popularity with fans, his profile sponsors and his bargaining power heading into yet another round of negotiations with Mayweather’s camp. Not that any of those factors bring this fight any closer to actually happening. Hours after Mayweather announced his attention to fight May 5, Pacquiao promoter Bob Arum dismissed the statement as a joke, mused publicly about scheduling a Pacquaio fight for April, then started a ridiculous rumour that Mayweather planned to face faded legend Erik Morales.